With both drivers contributing to the points tally, though his team still finished eighth in the standings, 2017 witnessed Haas score 18 more points than in its debut season. However, in its second season, facing a major overhaul of the aero regulations, the American team clearly struggled, and but for McLaren's woes could have slipped further down the rankings. Looking ahead to his third season in F1, Gene Haas admits he and his team are still learning. "It was a learning year," he admits. "Our first year, everything was new and everything has to be mentally digested about how do we go about racing in Formula One. In the second year, we understood a lot more in terms of what we were missing, and it became obvious midyear that our cars just weren't fast enough to really be competitive. "Some tracks they were quick, but other tracks they weren't, and the question was, ‘Why did that occur?' and ‘What are we going to do about that in the future? ', and that's really a big pivot point for us going forward, how to solve those issues." "In our first season, we were extremely lucky to do as well as we did," he admits, "because in the second year there were a lot of races that we just felt lost. "You would think that in the second year we would've been better at that, but I felt that we were actually worse and it became more obvious about what we had to do to find what we were missing. "If you don't know how to solve some of these issues, you go out and you just have a really bad day, no matter what you do. And that's really frustrating because you're supposed to be out there doing your Free Practice 1 and 2 and you should get better, but it's like you would go out there and do Free Practice 1 and 2 and the third one would be worse and you're going, ‘Wow, what are we missing here?, and we would ask, ‘Well, is it a driver issue? ', ‘Is it a car issue? ', ‘Is it a tyre issue? ', and I think we've been able to narrow it down to determine it's a car issue that effects the tyres which makes the driver not able to perform." Asked if any elements were easier than 2016, he replies: "Nothing was easier. It was more difficult and I think it was more difficult from the standpoint that the competition was more intense. "The first year it seemed like we had more teams that were having challenges. It seemed like in the second year a lot of those teams sorted out their problems and all of a sudden they got a lot faster. The spread between the top cars and the bottom cars when we first started was four to five seconds, and now it's down to three seconds. The field is tightening up and everyone is getting better." Asked if there was a highlight, he says: "We had two races where we scored double points... Monaco and Japan. Those were good and I was hoping that we could do better near the end of the year but, ultimately, we didn't. I felt like we were 10 points shy of where we really needed to be, but it also brought into focus where those areas are that we need to work on." "We want to solve these technical issues that are holding us back," he admits. "Tyres are the toughest issue we have because you have to keep the tyres in a certain temperature range, but how you keep the tyres in that temperature range is how you handle your downforce and your drag and how you handle sliding the tyres. "The tyres are very sensitive to downforce, overheating and sliding, but in order to get the tyres right you have to have the right chassis and the right aero. Without all of that working right, the cars become very difficult for the drivers and you can't expect them to make up for a car that just doesn't have the capability of holding the track." In addition to stability in the rules this season, Haas is another team retaining the same driver line-up. "I thought our drivers were better than our cars in 2017," he admits. 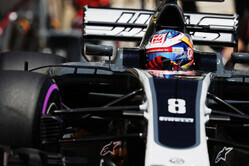 "Grosjean is a very, very fast driver. His driving style is very different from Magnussen's style. 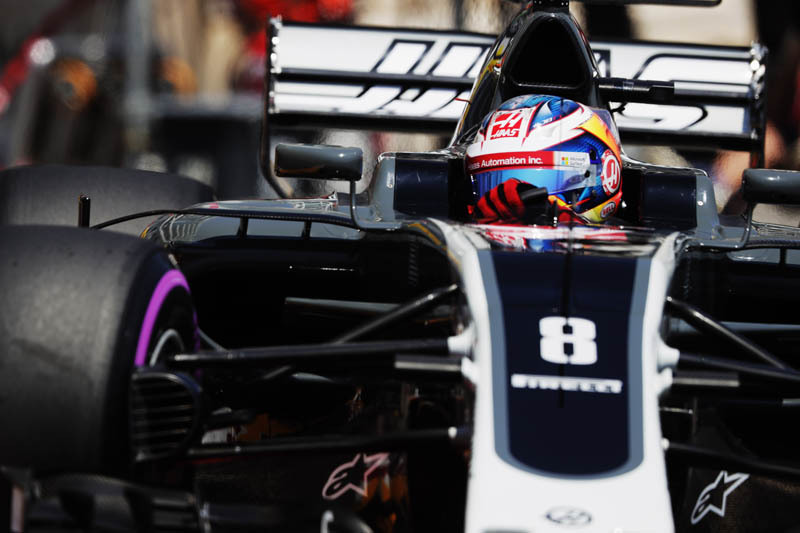 Grosjean is more hard-charging, braking and going through the turns. Magnussen is a little smoother going through those turns. They just have different driving styles, but they are both very aggressive and both want to win, and you have to have that kind of killer mentality to score points. "You just have to. When the opportunity is there, you just have to go for it. That's hard to find in drivers. They are all that way. They won't give an inch to anybody and when it comes down to it, you really have to want to win, or at least score points. That's what we have with our two drivers. "(Their) competitiveness works well," he continues, "and it's not a negative because they work well together. They know what they're doing, so I think that they kind of help each other, but they are competing against each other. It's pretty amazing how the two cars are almost always close to each other in qualifying and practice, so you know the drivers are extremely capable. If we give them fast cars, they'll move right up the ladder." Returning to the forthcoming season, the midfield is likely to be more competitive than ever. "It looks like everyone is going to be better," he admits. "We identified our weak spots and Guenther and I had a good heart-to-heart talk on that one in Mexico City about what direction we were going to take and how we were going to improve. "It's no secret we use a lot of Ferrari equipment, so we're using them as our baseline. We need to be within a half-second of the Ferraris in order for us to be competitive. We weren't last year. I would say we were a second to a second-and-a-half slower than the Ferraris. Overall, we were maybe two seconds off the pole qualifiers, so we need to knock a second off that if we really want to be competitive." Asked where he stands on the three-engine allocation this year that appears to have split the teams, he says: "It's like anything else, the more seasons you have with an engine package, the more reliable it's going to become. "I have no doubts they can do the season with three engines. Plus, there's not going to be this tremendous need for upgrades because the engine horsepower has somewhat plateaued. They are getting about as much performance out of the current dimensional package as you can. I don't think Mercedes or Renault is going to be that much farther ahead or behind Ferrari. I think they are all within a half-a-percent of one other. I think from a reliability standpoint, the Ferraris are excellent. "We've eliminated a lot of the variables where we knew we were weak," he adds, "and we knew where we needed to focus. We need to be able to go to the majority of races and put the car down on the track and be fast. We've focused on what it's going to take to get the cars to be consistent and to close that gap between the top cars." Finally, asked, after two seasons, how he feels his team is perceived, he says: "Now we're just one of the teams, to the point where if we're in front of Lewis Hamilton or whoever, they don't go, ‘Who are these people?'. They know who we are. "I think it's good. In two years, we've survived. We've shown we can compete at this level, and the teams around us were all within a few points of sixth, seventh and eighth there at the end of the season. That was an interesting place to be, and I'm sure the teams in front of us were very happy that they finished in front of us because now it's like they have another competitor to deal with."